I have started a new quilt! Since seeing this, this and this quilt I knew I had to make a triangle quilt. I've cut my first triangles already last year, but I had so much other things on that they needed to wait. Since they are sewn in rows this is a very speedy process. There is a lot accuracy required when sewing the triangles together though. I followed this tutorial, but cut the tops of all triangles off by 1/4''. This way it was a lot easier to sew them together correctly. And then I pressed the seems to one side, alternating the direction for each row. That way the seems come together nicely when sewing the rows together. The quilt has already a name: Porcupine Playground. I love the word porcupine, it sounds so nice to my German ears. The animal is kind of cute too and I love the band Porcupine Tree. So all this is very suitable for a triangle quilt and the name was quickly found. This quilt is part of my to-do-list for 2016 and I'm happy to have started it! The fabrics are Kona white, berry and cerise, Carolyn Friedlander's cross hatch in grey and plum (so beautiful, I bought exactly 20'' and all of it is used up now) and micro mod/ vertigo by Rob Bancroft for Cloud9 fabrics. This was one of the very first fabric I ever bought and I'm happy it's getting used now. I also added some orange triangles to pep the whole thing up, that's Oakshott in orange. I have already plans for the quilt back and will hopefully have this done in the next 2-3 weeks. Can't wait. I love this quilt already!! Beautiful fabrics! Yay for a quick quilt top! Thank you, Debbie! First time using purple and loving it! 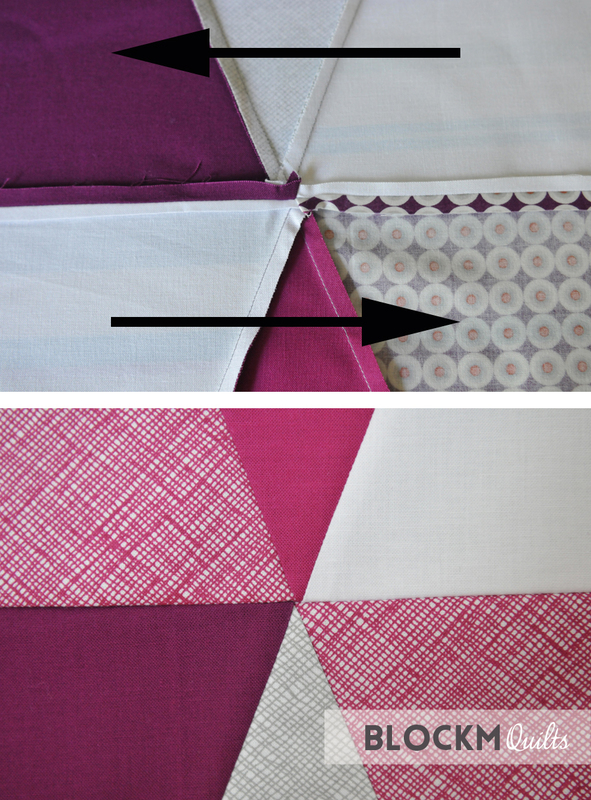 I love the colour combination on this quilt - just divine! Thank you so much, Sue! Can't wait to have it finished! The orange triangles really makes it! It also was on my list and I'm happy I'm doing it!! I love that pop of orange! Your triangles look terrific. 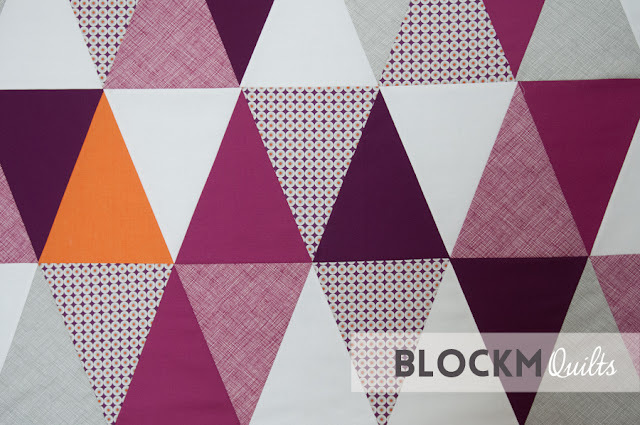 I've never tried a triangle quilt before, but I love the idea of big triangles. Thanks so much! The size of the triangles is big indeed, and that's why it went together so fast! The orange works very well, I will also quilt it with orange thread along purple, can't wait!